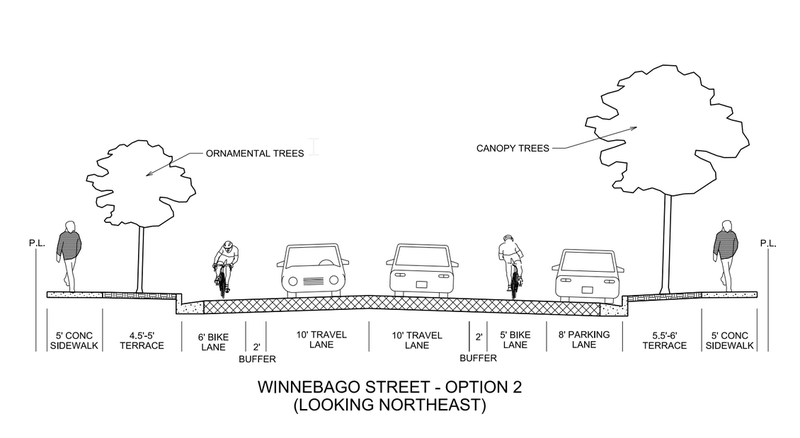 At last night's meeting, the Madison Common Council voted in favor of reconstructing Winnebago Street from Bashford to Second with buffered bike lanes and canopy trees (option 2)! Madison Bikes supported option 2 with a position statement that you can read below. The decision to remove on-street parking and reallocate that space for safer and more comfortable bike facilities and street trees is a major victory for active transportation and livability in our city. We'll have more details later. Thanks to everyone who contributed to making this happen!